First Look: Destiny Treasure Maps! It’s unclear exactly how Treasure Maps will work, but they seem to be some sort of mission – (some?) with clues – that will eventually lead to various rewards. As you can see, even with the lack of a proper description, there are currently Uncommon, Legendary, and Exotic “Treasure Map” items as well as a few “maps_clue” items to help us find the treasure. 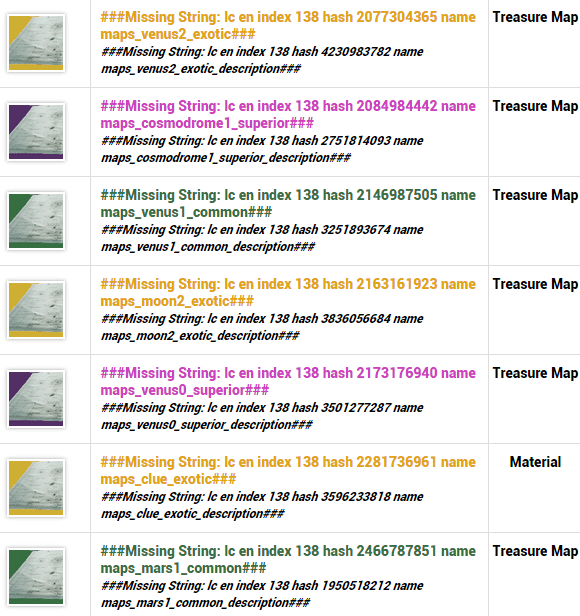 The Treasure Maps are designated as Missions in the database. These could turn out to be really simple “search and find” missions similar to finding a Dead Ghost, or more complex activities that will have us looking for, killing, and/or uncovering lore that’d eventually lead to a reward. It’s reasonable to assume that the higher tier treasure map missions will be more difficult & provide better rewards. I’m most excited to see what the Exotic Treasure Maps will bring – maybe the Exotic ship? Obviously the names and descriptions are incomplete, but it looks like Ships are going to be at least one of the possible rewards from Treasure Maps. When these Treasure Map items have actual names and descriptions we’ll definitely let you guys know about it! Hopefully the descriptions will give us some insight into what type of tasks we’ll need to accomplish. Are you excited to learn more about these new mission types? What do you think will be rewarded for completing the Exotic missions?